Here’s the thing about Bouchon at lunch: it was almost entirely empty when we went. To put this into context, somewhere right now in America a person is being handed a beeper at a Cheesecake Factory and being told that the wait for a lunchtime table is 30 minutes. It’s kind of shocking, when you think about it, especially when you see the pictures of the food that we ate. There’s only one word I can think of to describe this meal: flawless. 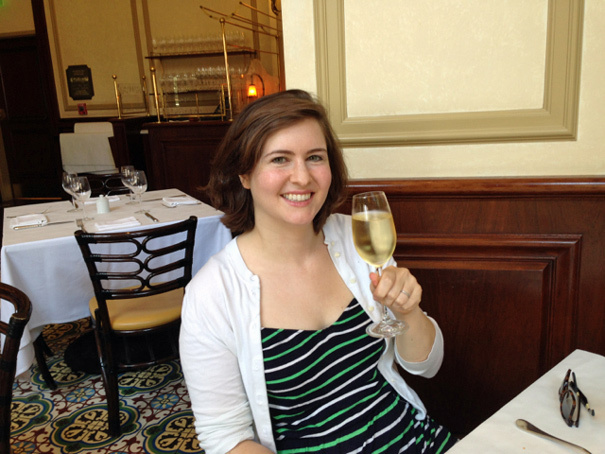 Here’s Diana with her glass of something bubbly, a fitting drink for a birthday lunch. Lean into your computer screen and you’ll see the skill expressed in this deceptively simple dish. See those vegetables in the spring vegetable vinaigrette? Look how perfectly they’re cut. That’s textbook knife skills, right there. 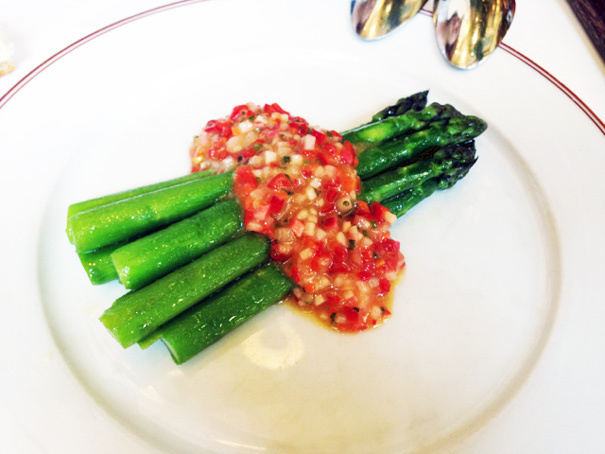 The flavor profile was similar to that of a gazpacho; used as a dressing, it pepped up the perfectly cooked asparagus (firm, but not raw) without overwhelming it. 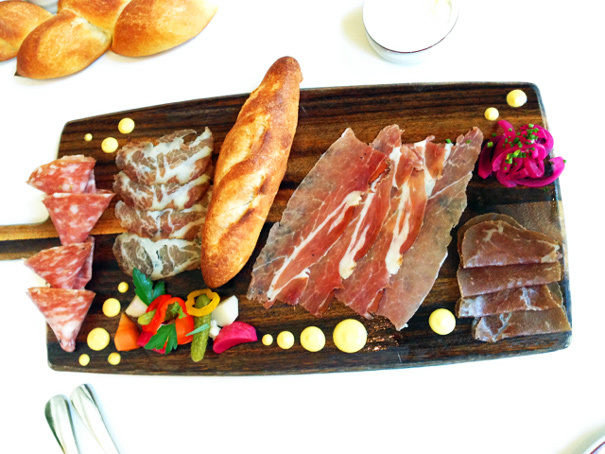 Not only are these meats cured in-house, they’re presented in such a way that it almost feels criminal to touch them. It’s probably the prettiest charcuterie plate I’ve ever experienced, with Bestia being a close second. For the entree, we shared a Loup de Mer en Barigoule and the restaurant did something that I love, the classiest of classy moves: they split the dish for us in the back, making each half-portion as beautiful as a full portion. Everything about this dish was lovely–the simultaneous richness and lightness of the sauce, the appealingly sour taste of the artichokes–but nothing impressed me more than the crispness of the fish skin. I’ll have to crack open my Bouchon cookbook to figure out how it’s done; it was like the world’s most elegant potato chip. 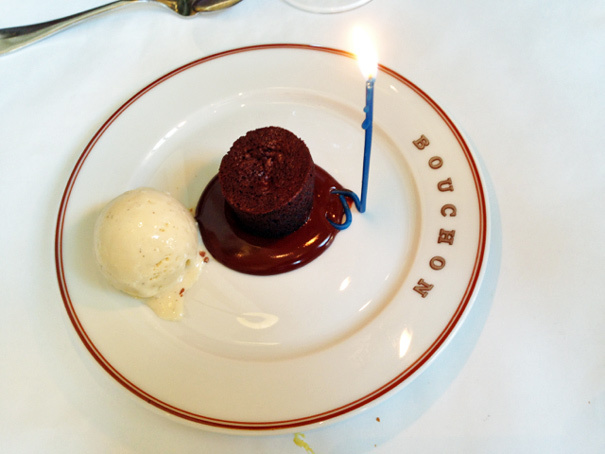 Another classy move from Bouchon: they picked up on the fact that it was Diana’s birthday and sent over this little chocolate bouchon with ice cream and a candle. 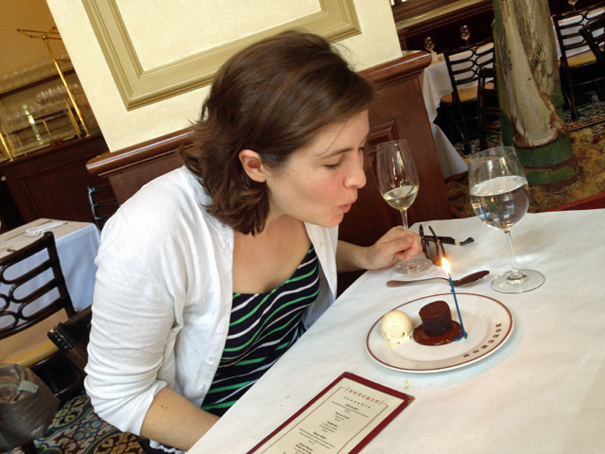 But it wouldn’t be a real birthday without a proper dessert from the dessert menu, would it? 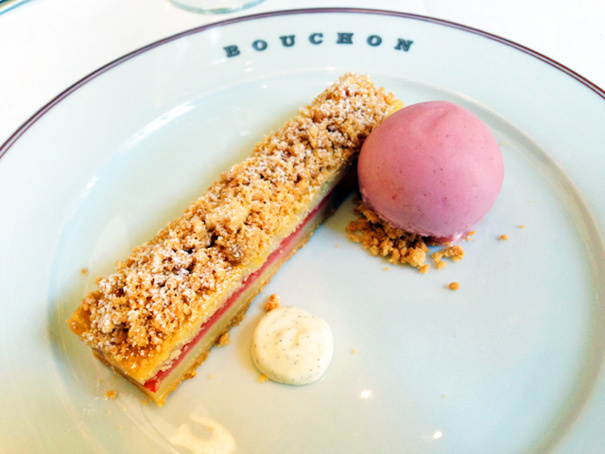 Here’s our springy rhubarb tart with strawberry sorbet to finish the job. 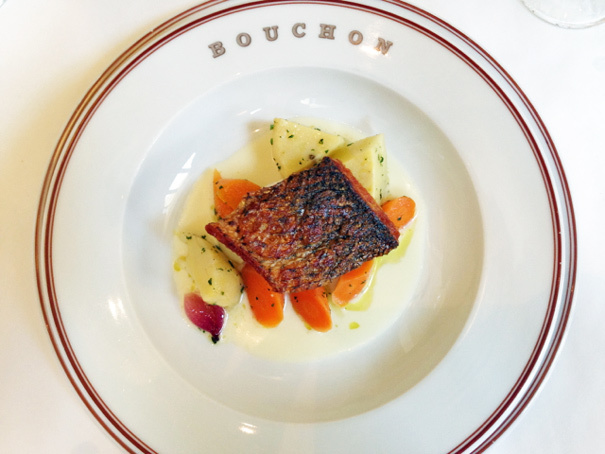 Bouchon feels like a hidden-away treasure here in Los Angeles, a palace of riches there for those smart enough to grab them. So you go ahead and order your Double-Stuffed Oreo Cheesecake after your beeper beeps; the next time I have a special occasion lunch, I know where I’m headed.